As you read the bible, you see that Jesus knew the power of questions. His basic teaching method was to answer a question with a question. Or, He answered with a story that provoked His audience into asking more questions. He wanted the people to struggle with the issues, because struggling excites the brain. It creates chemical changes that open the mind to processing new ideas. A good question period is like a cup of strong coffee. Students and teacher are energized and everyone has a good time. This means that the question period is where you can shine as a teacher. Where do we find those challenging and intriguing questions? These teachers went on to develop material that enabled educators to ask more complex questions. They defined the different categories of questions and offered numerous question stems. Each lesson on my website ends with numerous questions ranging from easy to difficult. The wide range allows you to choose those most appropriate for your age group. They were developed using Bloom’s guidelines. Can you name all the…? Which is true or false? State in your own words. Explain why . . . This represents . . .
What seems to be …? Is it valid that …? Show in a graph, table. What restrictions would you add? Can you clarify. . .? Can you illustrate . . . ? Does everyone think in the way that … does? Choose the best statements that apply. Tell how, when, where, why. Does everyone act in the way that … does? Explain why a character acted in the way that he did. Do you know of another instance where …? Can you group by characteristics such as …? Which factors would you change if …? What questions would you ask of …? What does the author assume? What’s the main idea? Theme? What literary form is used? What persuasive technique is used? Determine the point of view, bias, values, or intent underlying presented material. If … happened, what might the ending have been? Can you explain what must have happened when …? What were some of the motives behind …? What are some of the problems of …? What fallacies, consistencies, inconsistencies appear? Which is more important, moral, better, logical, valid, appropriate? Is there a better solution to …? Can you defend your position about …? Do you think … is a good or bad thing? How would you have handled …? How would you feel if …? What are the consequences of …? What influence will … have on our lives? What are the pros and cons of …? Why is … of value? Can you see a possible solution to …? If you had access to all resources, how would you deal with …? Why don’t you devise your own way to …? How many ways can you …? Can you create new and unusual uses for …? Can you develop a proposal which would …? How would you test …? How else would you …? For your Q&A, include questions from the above categories: Remember, Understand, Apply, Analyze, Evaluate, Create. The variety addresses the different needs of different students. Future engineers will respond to questions that call for knowledge, and the future writers will tune in to questions that call for imagination. As they listen to each other, they expand what they are learning. Your role is to encourage your students. Urge them to ask questions, share ideas and guess at answers. Prod students into agreeing and disagreeing with each other. Frequently praise them for their good thoughts. Include your own questions. We must teach our students to accept mystery and to tolerate uncertainty. Know-it-alls live in a spiritual casket. There were times in my teaching career when I asked an entire class to say, “I don’t know,” three times. This was practice for resisting the temptation to assume we know the mind of God. Usually, “I don’t know,” practice was in response to someone who had explained why God had done something. Once I brought a newspaper article to class that quoted a person proclaiming that God had caused an earthquake in a certain city because it was so sinful. Assuming we know the mind of God is dangerous territory. It is okay to wonder aloud and to speculate, but the religion teacher should teach his/her students to distinguish between speculation and Revelation. If you wish to increase your ability to craft and choose good questions, there are two sources of information that I found most helpful. 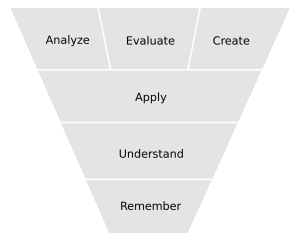 The best known is Bloom’s Taxonomy of Questions. Another is Lisa Howard’s small book, the Teacher Training Manual. Her methods are a good example of following Bloom’s guidance. The best way to define a desperation question is to describe an incident from my experience as a junior high teacher. Sometimes we teachers are given material to teach that is just plain awful. But, the lesson must be taught! When in this position, I found that it was effective to bare my soul and throw my lot in with my students. All of us were victims! One day, I was required to show a 20 minute film to my class that was borrrrrrrring! Presenting a dull lesson is a most precarious position to be in if you are dealing with junior high. Shared victimhood was my only hope. Before showing it, I threw up my arms and confessed that I hated the story. “It was stupid. It was ridiculous!” Since teachers seldom knock their material, this caught the students’ attention. Then I declared, “As you watch, note all the things you don’t like. We will make a list and send it to the publisher.” That was my desperation question. After our postmortem, a most enjoyable feast of complaints, I asked them to identify the teachings in the film and to give the publisher some ideas for improving the script. By doing this, they did deal with the aim of the lesson and finished with positive action. Sometimes a little theater is a good teaching method. And, yes, I sent a letter to the publisher, which I showed to the class. It was very polite, but there was no response. 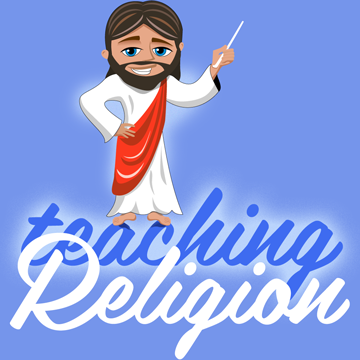 The second category I will add is one that helps students learn to view the secular world through the eyes of faith. Use religious vocabulary to identify actions that are religiously motivated. As your students do this, their heightened awareness of the presence of God will strengthen their sense of connection to Him. You can facilitate this by using religious words to interpret events in a secular story. For example, see the story, Cowboy Jake and the Pranksters in the file: Storytelling: The Good Samaritan. Religious words are in bold type. In the Question section I asked, who was the good neighbor in this story? What amends (or penance) did the boys do? Who did God’s Will? Was anyone tempted to ignore God’s Will? After each lesson, suggest students observe events that happen in their home, neighborhood or school and report the following week about a person who performed a religious action. Was someone a good neighbor who performed an act of kindness? Did someone apologize and do something to make up for a wrong? Did you observe someone making amends, doing penance or doing God’s Will in another way? “BloomsCognitiveDomain” by Nesbit (converted by King of Hearts into SVG) – Image: BloomsCognitiveDomain.PNG. Licensed under Public Domain via Wikimedia Commons. “Blooms rose” by K. Aainsqatsi – Own work. Licensed under CC BY-SA 3.0 via Wikimedia Commons.